Dinastia Hidalguense - "Sones Huastecos"
Dinastia Hidalguense chose their name carefully. Dinastia because they all learned to play at the feet of uncles, fathers and grandfathers in villages where son huasteco has been the music of fiestas and dances for longer than anyone can remember. 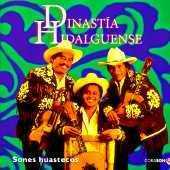 Hidalguense because, although they now live in Mexico City, this is a country band whose music, like their fans and their family, is still firmly rooted in Hidalgo state, in central Mexico.